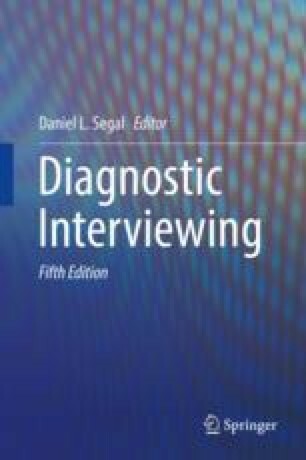 In the 10 years since the publication of the 4th edition of this book, there have been some significant developments that affect how clinicians conduct a clinical interview. First, the American Psychiatric Association published the fifth edition of Diagnostic and Statistical Manual (DSM-5) in 2013. Some of the changes to DSM-5 include the elimination of the multiaxial system, changes to diagnostic criteria for Autism Spectrum Disorder, and the addition of several new diagnoses, including disruptive mood dysregulation disorder (DMDD), avoidant restrictive food intake disorder (ARFID), and binge eating disorder (BED). These modifications necessitated changes to structured and semi-structured interview schedules based on existing diagnostic categories (Leffler, Riebel, & Hughes, 2015; Robins & Cottler, 2004; Segal & Williams, 2014). Second, Congress passed the Mental Health Parity and Addiction Equity Act (MHPAEA) of 2008, with the intent of ending long-standing insurance policies that discriminated against those with mental disorders. Although parity in reality has not yet been achieved (The Mental Health and Substance Use Disorder Parity Task Force, 2016), the law underscores the importance of clinicians accurately and efficiently diagnosing mental disorders. Third, changing societal conditions, including the rising opioid epidemic (National Institute on Drug Abuse, 2018) and a recent spike in suicide rates (Stone et al., 2018), make it imperative that clinicians know how to accurately diagnose and effectively treat mental health issues.